Last Thursday (April 2), Google unveiled new shortcuts in their SERPS, displaying a single line of four links that take search engine users deeper into a site, bypassing the page shown in the results. These new shortcut links are being called “One-Line Sitelinks”, or alternatively “Mini Sitelinks”. The above example hints at an algorithm for pulling One-Line mini sitelinks that matches the full-fledged Sitelinks usually displayed for “brand matches”, except One-Line Sitelinks pull only four links — and as far as I can see, not fewer than four. In the case of Children’s Healthcare of Atlanta (CHOA) (the first result in the screenshot above), the One-Line Sitelinks match the first four links displayed in the regular 8-link version of the full-size Sitelinks. These four links are not necessarily the main navigation items, and the titles come from a combination of anchor text and page titles. For my previous observations on how Google is determining which Sitelinks to display and what text it uses to describe them, please see: What Info is Google Using to Display Sitelinks? It really makes you wonder why the results displayed in positions #1, 3, 4, 5 and 6 are good enough to outrank KidsHealth.org, but not good enough to get a line of Sitelinks. 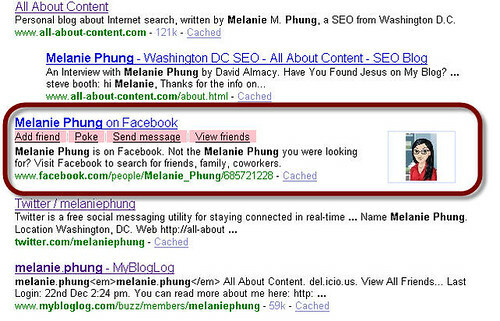 How Many Sites Will Show Sitelinks On a Single SERP? Given that Google is displaying these links on multiple results on a single page and on results near the bottom of the page, there’s no reason to think that it couldn’t theoretically include One-Line Sitelinks with every result. In both cases, the site is in the #1 position for the query and in both cases the Sitelinks listed are the same (they match the four links displayed for a “brand query”: [Insure Kids Now] — In this case, the site does not have a full 8-pack of links, even when searching on the site’s exact name). Having 1-Line Sitelinks appear underneath your results for one search query, does not guarantee that you’ll see 1-Line Sitelinks for your site on other search queries, but it’s logical that similar search queries would improve the odds. Check out this example where Google is perhaps trying to calculate just how close to a “brand” fit, the site might be. So now we’ve seen queries that bring back traditional Sitelinks and queries that bring back the new abbreviated Sitelinks. But will Google show both traditional and abbreviated Sitelinks together? Yep. It’s surprising to see a single domain get two sets of Sitelinks here, as you’d expect there to be overlap (thus wasting valuable SERP real estate), but in the above screenshot, only one link is repeated, and that’s because the Sitelinks for the second result are specific to the subdirectory. As you can see, much like the examples I posted previously of Sitelinks showing up on subdomains and subdirectories, these new One-Line Sitelinks are not reserved just for “homepages” or domains; One-Line Sitelinks show up at the folder and subdomain-level as well. Based on what I’ve observed so far, it’s hard to predict where these One-Line Sitelinks will show up, but the same rules seem to apply as getting regular Sitelinks: a site needs to have some amount of authority for the query (although clearly not as much as before) and also have strong internal navigation/site architecture that Google can use to determine which links get displayed; Sitelinks links frequently are those high-level pages most prominent in the navigation. What Info is Google Using to Display Sitelinks? Although it’s been a while since I’ve been active on Flickr, my posts on Flickr Explore and the Interestingness algorithm still get steady daily search traffic. People want to know what Flickr Explore is, why photos got dropped from Explore, and what the secret to Flickr’s Interestingness algorithm could be. But a consistent percentage of traffic seems to be asking the very basic questions: How do I know if my photo got into Flickr Explore? … and, How can I tell which of my photos are in Flickr’s Top 500 list? 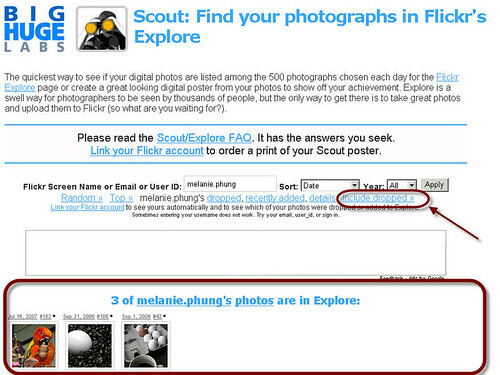 If you’re trying to find out if you made Flickr Explore, the easiest way is to go to Flickr Scout, a tool created by Big Huge Labs. Enter your username and click “Apply” to see which of your photos (if any) made the cut. The default view shows you which of your photos is currently part of Explore. Click the link “Include dropped” (underneath the line of drop down options) to see ALL your photos that have ever been deemed worthy of Interestingness in the past. And there you have it, the easy way to find if your photos got into Flickr Explore. Once you’ve identified which of your photos made it into the Top 500 of any particular day, you can tag them with ExploreDDMONYR, where DD is the day, MON is the 3-letter month abbreviation and YR is the two-digit year the photo was uploaded (example: Explore16jul07) and Interestingness###, where ### is the position your photo achieved (example: Interestingness86). And don’t forget to check your stats (you have access to stats if you have a Flickr Pro account) to see if which photos are drawing eyeballs and where traffic is coming from. When I search “melanie phung” and clicked through to my blog, I got a bunch of “Melanie B ringtones” [AdSense] ads on my site. When I get to my site via SEO-related terms I’m presented with search ads. The content on the site, in both cases, is obviously identical (and not at all related to ringtones or “Melanie B”). In theory, you wouldn’t appear in the results for search terms that aren’t aligned with your content — in which case, AdSense could match ads to either your content or the referring search query and it would be six of one/half dozen of the other — but we know that isn’t true in reality; often users find our pages using search terms that have nothing to do with our content.”Contextual ads” that place advertisements based on broad match keyword search terms rather than landing page copy can easily miss the mark and create message mismatches that could have advertisers annoyed and uncomfortable. And that’s nothing compared to what could happen with this new behavioral targeting Google AdSense is rolling out. Donna just made some compelling observations about how Google’s behavioral targeting could be a nightmare for publishers and users alike over on SEO Chicks. I always thought the beauty of AdSense is that it matches ads to content. Messing with that formula seems like a losing proposition – for users, publishers and advertisers alike. What do you think? Would you, as a Web user, click on AdSense ads targeted at you, even if they aren’t relevant to what you’re currently doing? As a publisher, how do you feel about ads on your site that aren’t related to your content? Should advertisers on Google’s Content Network worry this will hurt their campaign performance? Updated March 12: Also read Aaron Wall’s critique of grave privacy issues, and Bob Massa’s impassioned comment in response. When faced with scary economic times, the instinct is often to dig in, batten the hatches, hunker down and try to stay safe… in other words, play it conservative. The other option is to seek out and embrace new challenges. And with that by way of intro, I have some news to share: I’ve left New Media Strategies, the national leader in digital PR and word of mouth marketing for Fortune 500 companies, to go much smaller and deeper. Starting at the end of the month, I’ll be joining the team at RedEngine Digital, an integrated marketing firm that specializes in online marketing for nationally acclaimed non-profits, associations and businesses. Offerings include SEO, paid search, A/B testing, online fundraising, membership acquisitions, and email marketing — all with an eye on running highly profitable campaigns. As RedEngine’s new Director of SEO and Online Marketing, my responsibilities will include search engine optimization (naturally), strategic marketing and social media… and the RED website. I’ll be able to have direct, quantifiable impact against specific goals; there’s something exhilarating about being held accountable by hard numbers. Even better, clients include non-profits that advocate for issues and causes I can get passionate about. What does this mean for this blog? Expect nothing to change. I’ll probably maintain the same erratic publishing schedule, with posts varying in quality from lame to surprisingly not terrible, on subjects ranging from the blog itself to banal observations about the state of the industry. 😉 Keep in mind that the really juicy stuff doesn’t get published here. I still won’t blog about my clients, “amazing SEO secrets”, or industry news already being covered ad nauseum on other SEO sites, although I might start blogging more about issue-related or cause marketing. For more frequent updates, your best bet is to follow me on Twitter, where I do drop a few nuggets of knowledge (usually from other people). And if you’re interested in what RedEngine Digital can do to turbo charge your marketing efforts, get in touch and let’s chat.